I have been waiting for it, and it finally happened. A syrnia user got access to someone else his account and stole all his possessions. The offender is jailed for 2 months, and all his possessions have been deleted. The victim has got all his posessions back. Another suspect is jailed for 2 months at the moment. The punishment may increase. Syrnia does punish account "hackers"*, unlike any other game. So please don't even attempt to gain acces to any one else his/her account. *=It is no real hacking at all. More than 99% of the 'Account hacking' is password guessing. So please make sure you got a un-guessable password. Update your password right away if you are not sure it is alright. I made some changes to combat, it should not affect combat VERY much, but I know some people will still think this update is bad whilist it is great. 1 The combat levels of monsters have been changed. 2 Some monsters got higher HP. 1 This does not matter at all, it's just an indicator and is now far more accurate. Monster combat levels now use the same combat level calculator as players and therefore you now know what monsters you could cope with. 2 I did not change the monsters HP, but the HP calculation is now using the same formula as for players, thats why this new HP value is required. In the old code power and aim had too much effect, and the attack level was almost useless. The combat formula is far more balanced now, I didn't notice too much difference in damage dealt and damage recieved. The maximum possible damage will be a little higher, but the average damage might be a little lower because of the attack level and aim value. Combat has changed, this can mean it COULD happen that you are now not able to kill an monster you were able to kill before this update. If you die due to this changes it is at your own risk since YOU attacked the specific creature. Tip: On the new system check if you notice any differences/dangers at some low level creatures, then kill some monsters of a higher level and check what levels your able to safely fight. The best 10 entries of the Striped red fish are displayed below. The best 3 entries have been payed by the citizens of Holiday lake. The best 10 entries are displayed below. The best 3 entries have been payed by the citizens of Syrnia celebration center. Yep, syrnia started 05-03-2005, and is one year old today. To celebrate this the celebration island has been opened with some contests. I somehow became interested in building websites, forgot why, and made my own personal site, just to put some pictures online. I was 15 years old. I heared ‘big guys’ talking about some better coding language and wanted to learn that too, so 1 week before vacation I printed some tutorials and read them during a few math lessons. I also don’t know why I started making a game without any coding experience, but it seems to be the easiest way to learn to code. I began building Warrior Fields (1) in a vacation may 2004. It was ready to be launched within 1 week: 5 may 2004. I didn’t have any coding experience yet, and learnt it all while building this game. It didn’t have much players, but it had very dedicated players already, the community was very nice. They told me WF could have a big future, and they gave me lots of update suggestions. I started Robot revolutions, my second web based game so far. The idea behind this game was pretty cool: all players should work together and have 1 month time to kill the 10 million enemy robots which have taken over the earth and are invading the last humans alive. Robot revolutions and warrior fields never managed to get more than 1000 (registered!) players, I don’t know why, but I didn’t do much ‘marketing’ either, more marketing should have helped. Somewhere about march the first I was chatting with some friends, and wanted to do something else than WF and RR. 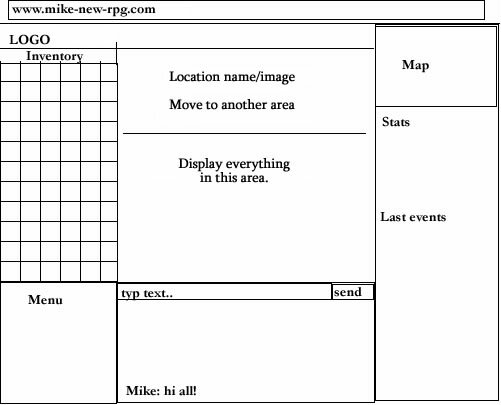 So I made a new text document and called it ‘M2HRPG’ since I knew I wanted to make an RPG. I began typing 2 pages about how the game should be like, but this was just a joke since there were no real text based RPG’s with a working inventory, just like in a real 3D game. I still got this text document, Syrnia contains like 90% of what is written there. And it contains the skills: combat, mining, woodcutting, smiting, constructing, trading.It also contained the picture below, which is a sketch of how the layout should look like. I showed the document to some friends, and some players from WF. They seemed to like it, and I began building M2HRPG, but I didn’t want WF players to think I’de stop updating WF since this RPG was just for fun, I didn’t think it would be a success at all. I ran a 1 week beta of M2HRPG and during that beta I made up the name ‘Syrnia’ with a friend. We both knew we would need the S and the Y in the name since they look good . Sary, Sernya, Suly, Yser….. we typed some random characters and found the name Syrnia within 10 minutes, we knew it was alright . So when that 1 week beta was done I officially launched it 5 march 2005. Syrnia started pretty good; 100 members in 3 or 4 days, WF and RR didn’t start this well, but those 100 players were ofcourse players from WF and RR which were referred to Syrnia.What happened to Syrnia from 5 march until now can still be read at the news, so I won’t discuss that, only some highlights. Shutdown of WF and RR: 29 April 2005 I shut down both WF and RR due to the success of Syrnia(to save some server speed). I gotta remind you that I started it as a joke. The rat invasion: My favorite invasion! Chaos everywhere, no one was able to work, and new players didn’t understand there was more in this game than rats. Would love to do another world wide invasion which stops everyone from working . New servers: I have had like 3 servers new, and have upgraded the parts several times.I Learned a lot about computers and their operating systems. Im still very thankfull towards Akast for their sponsorship when we were in bad need of a new processor. Our community: We have had lots of happenings, we got an interesting community. We have always had problems on the chat too, there have always been a big ‘bad’ side in Syrnia. If bad things happen on chat, I or the moderators will act if we can. I might regret saying this: But a game needs a bad site, players will hate them and try to get better than that group…but this does not mean we stop muting/jailing bad players . I could have not run the game without the moderators, I do not thank them enough. It would have cost me a lot of time to answer all the players messages and to keep the chat and forum on a normal ‘level’. The moderators have got a hard duty: It is very hard to judge a situation unbiased. Moderators usually do this very well. Please, next time before judging a moderator’s action, try to look at the situation unbiased . This game would also have not excisted without the donators, thanks to them we can keep Syrnia running using good hardware and a better connection (Yep the faster connection will come soon). I hope Syrnia and the donation options are still worth your donation . I even need to thank my family and friends for any support they give me. I can talk about Syrnia with them and always tell them how much players are online, even when they are not interested . And of course, I cannot write thanks to everyone without thanking the players. Since they decide what the game is like and they create the community. Thank you for playing Syrnia, I hope it gives you a lot of joy. We made Syrnia a nice place together. This new Syrnia year will be as good as last year was: a lot updates and good game play, but I’ll make sure the game will be a lot less laggy. I’m also sure we will get more players. I think the lag is still under controll :). Oh, by the way, Syrnia will be 1 year old tomorrow. There was some massive server lag last week, but it has finally come to an end. The servers 'CPU usage' was way too high (it was at 100% all the time), and with some very valuable help I was able to reduce this to 10% ! I know how to reduce even more server lag, but will do that later. I think the server is now ready for the 100mbit line I've been promising all the time. As soon as the 100mbit line is available the server will be moved. I hope to add a nice update soon, have fun playing syrnia. 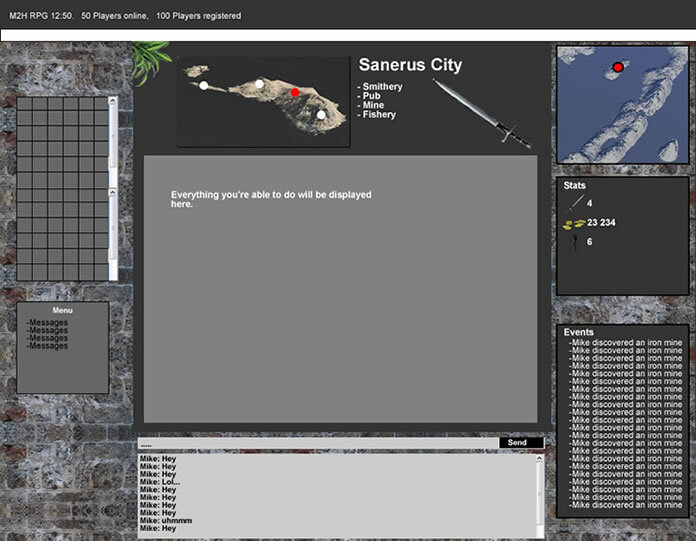 Warrior Fields (WF) was the first game I made, about 2 years ago now. I rebuild WF during times I was not able to work on Syrnia and it's done now. Syrnia has, and will always have, the highest priority. New server casing was ordered yesterday, thanks to the donators, and will arrive in 4-8 days. There will be some downtime while installing it, but afterwards the the server will be ready for the 100mbit connection. After making sure everything is working properly for some time, the server will be taken to its new location (yes, this means some more downtime) where the fast connection is. So right now it looks like it will be ready in no more than one month's time if everything goes well. 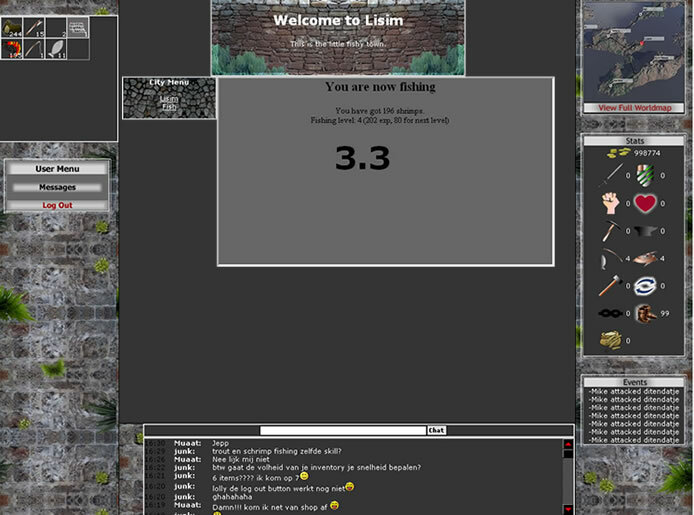 I did some performance updates to the highscores and the chat, this greatly improved the server and connection speed. The chat will now only load new chat messages instead of the whole last 15 lines(That's what the old chat did). This saves 800% connection speed now. Since the chat text is now stored localy on the user it's computer I changed the chat text limit (In the scrollbar) from 1500 to 5000 characters, enjoy scrolling down! The highscores now refresh every hour, this will save the server a lot of work. I also added a nice extra for all donators who donated 10 euros or more: The chat will refresh 20% faster than normal. The server can now handle 175 pretty wel. I think the server is now capable to run about 200 players online at the same time. The connection though is starting to lag at about 175 players, but we will move to the 100mbit line I wrote about earlier. Maybe this chat update will save us a lot of connection speed so we can have 200 players on without lag ? Durabiliy of equipment has been added to Syrnia. Equipment can be damaged and destroyed. While working (Mining, fishing, smithing, woodcutting) your tools can break. And when fighting, your equipment can be damaged, damaged items will be destroyed(Deleted). We will not be allowing you to repair your damaged items. All damaged items will be discarded immediately. How long it takes to break an item during a fight depends on the type of metal.Elven armour lasts a lot longer than bronze amour. While smithing items you can now gain a 'perfectly smithed item' it will have a durability bonus and could last 4 times longer than a normal item. I know a lot of fighters will complain, but there's no need to. This has been added to add some more trade in Syrnias economy. To compensate the fighters losses a little more elven armour/weapon drops have been added. The last note for fighters: You better not be sad, some huge updates will come for you..Including the group fighting wich some of us has tested. At last, a thieving update ! Locked items can now be found in the world of Syrnia. Some locked items can only be unlocked by very experienced thieves. Got a Locked moldy chest from killing ogres ? The Cave of Trades, an auctionhouse, has been added to Syrnia ! It's located at Eully and Ogre tradingpost but it's auctions are worldwide. You can auction your items here, a 5% fee will be charged if you succesfully sell an item. You get an message when someone bids higher on a item you have bidded on so you will be able to track your efforts. Santa is coming to the Syrnia Islands: Santa will be making a brief 2-day stay on Celebration Island. Come sit on his lap and ask him what you want for the Holidays. Keep in mind, you only get to visit him once. Sorry to our very very new players, but there is a minimum number of days you have to have been living in Syrnia, before Santa will allow you to visit him. Christmas Tree Contest: The lobby of Syrnia Celebration Center needs the 3 tallest Christmas trees that people can find in Festival Forest. The 3 people who find the tallest trees, will be monetarily rewarded. 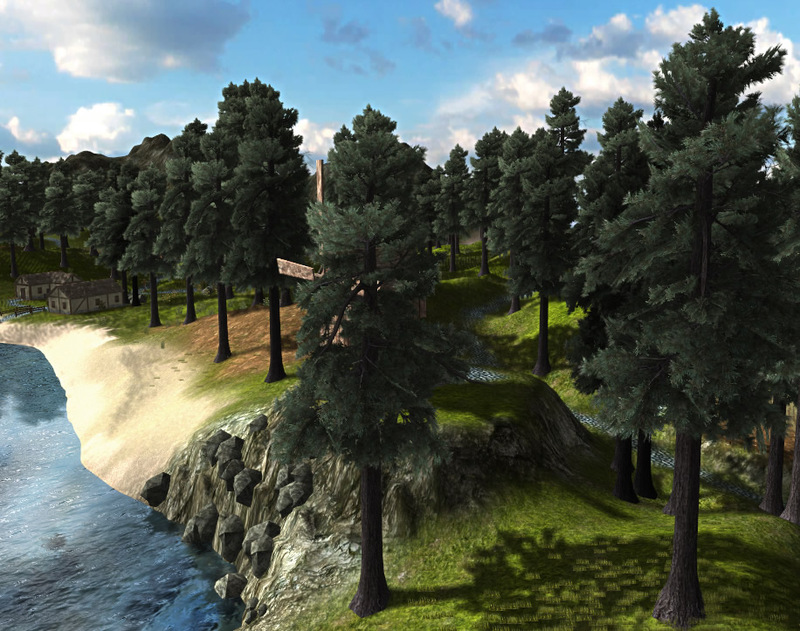 Also, as an added incentive for the person who finds the Tallest Tree, you will have the pub on Celebration Island named after you, for 1 year. So for future celebrations on this island, people will be able to drink and chat at your own named pub. Fishing Contest: We are also having a fishing contest at Holiday Lake. The 3 people who catch the longest fish, will each be monetary rewarded. Good Luck catching the elusive striped red fish. A special note on the Woodcutting and Fishing, there will be no 'crowding' effect on Celebration Island. All times are fixed so everyone is equal on Celebration Island, no matter your skill levels. Special Santa Gnomes will be coming to Syrnia to attack. Will you be one of the first people to steal one of their Santa Hats when they attack? I hope everyone has a fun time during the holidays. We hope to make this island a special place for everyone to meet during special events and holidays. Have a Happy Holiday season, and best wishes to you and your families. There have been some problems with cookies, reaching the site, and in-game images. Most of the problems should be solved by now. All problems occured because of a complete server installation. The server is running on a fresh new installation, a faster harddrive and double memmory. You will not notice much speed difference because the connection is the bottleneck...But we will move to a 100 times faster connection. I will wait moving to that connection untill I'm sure the server is stable. I also need to arrange some stuff before I'm able to move the server to the new connection. The server has changed, I decided the syrnia mainpage needed a new look too. I think it is way easier to get a good overview of the site now. Old forests are harder to cut and only skilled people are able to cut these forests. Every forest contains different types of seeds and wood (Unique experience, time and wood amount per cut). A small note: Syrnia might be down saturday for about 1 to 3 hours. I might upgrade the server that day. It's not sure yet though. The server was down for about 45 minutes because of a strange error. It's all fixed now, but soon the server will get a complete reinstallation. The server should not give any strange random lag anymore after the completee re-installation. Also thanks to the donations this month I can buy some new memory and double the total amount of memory in the server(A lack of memory was related to the error). When re-installing the server it might be down for a little while..but during the downtime you will be able to play syrnia on another temporairy server. The harddisk wich was bought using donations from a few weeks ago will be installed at the same time. So soon we will get double memmory, a faster harddisk, and properly installed server. This should speed everything up very much. Besides the server I also got a new sponsor (Akasts sponsership lasts untill 10 december). The new sponsor offered me a great deal on a 100 times faster connection !! We will switch to this faster connection when the server runs properly. I launched a new site today. It's goal is to earn money for the server without any of you paying for it. But I do need your help to gain the money. The website is an advertising site for anyone with a website. I hope you can contact some company's and refer them to my new website. I think this can even work as well, or even better than the donating option since companys got alot more money than we do. Now companys finally can contribute to Syrnias server and in exchange they get alot more website visitors. Read the 'How to support Syrnia' page in-game to check out all details. Pirates can now build and use Brigantines instead of sloops. They are constructable ONLY at the stockhouse, cost 3000 wood and level 15 constructing is required. A few days ago I added the clan list at the highscores, forgot to note it in the news. I fixed a bug in the drops in fights, the monsters now correctly give you what they were always supposed to drop.. I also managed to speed up walking trough the outlands, it goes about 2 times as fast now. I was searching a sponsor to make a deal about a expensive new processor to save all the lag. Then I found Akast, I mailed them and got a reply immidiatelly, after a conversation Akast agreed on becoming Syrnia's official sponsor. Akast supports online gaming and helped Syrnia out. Their new webshop has just launched and I ask you all to check it out ! It's Akast who solved all our lag ! AKast, provider of I.T services such as Training, Solutions and Support, has launched its new webshop with great value products and very cool PCs. Soon there will be an in-game competition with some great prizes to be won, so watch this space. Don't forget to check out www.akast.com/shop/ for some great offers and to support our sponsor at the same time. The pirates are recruiting at Xanso for 24 hours. Between 15:00 19 october and 15:00 20 october everyone is able to join the pirates. After this there will only be recruitments during pirate attacks. 1 Keg of rum is required to join. We got new 3d pictures for all skills now. They will also show you what time of day it is in Syrnia: morning, day or night ! At what time do you usually play ;) ? Thanks go to Muaat for making the 3D images. You can now choose the side of the pirates and prepare invasions on the islands of Syrnia. This is the big update we have been waiting for. I have done alot of updates the last few dates but they all were too small to note. Captain Keelhail visited the islands of Syrnia today..
Captain Keelhail will return and the Islands of Syrnia will be attacked by thousands of his pirates ! Captain Keelhail will attack 22-09-2005..Accidental, this also is the 200th day of Syrnia ! I did alot of bugfixed and added other weaks to the game. But I also added a new random event; The locked chest event. The first one to guess the right combination on the chest can keep it's contents !